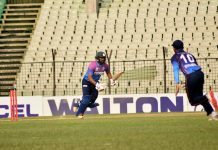 Brothers Union beat Agrani Bank Cricket Club by 4 wickets and avoided the relegation on the final round of Relegation League of Walton Dhaka Premier Division Cricket League 2017-18. Chasing 334, Brothers needed 4 runs in the last ball. Nazmus Sadat hit a boundary in the last ball to seal a thrilling victiry for Brothers. Earlier Agrani Bank were all out for 334 thanks to Soumya Sarkar’s blistering knock of 154. Venue : Bangladesh Krira Shikha Protisthan Ground-4, Savar. Result : Brothers Union Agrani Bank won by 5 wickets. Player of the Match : Soumya Sarkar.